An ornate yet homely Thai residence blending comfort and antiquity in an idyllic riverside setting, Baan Cheep Chang's heritage interiors are complemented by a landscaped garden and generous pool. 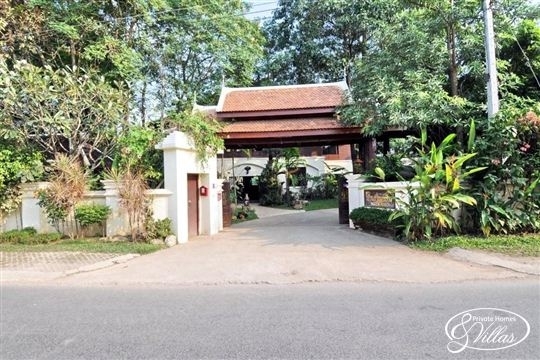 The villa is easily reached from the airport and is only a short drive from Chiang Mai’s famed temples, markets and restaurants. 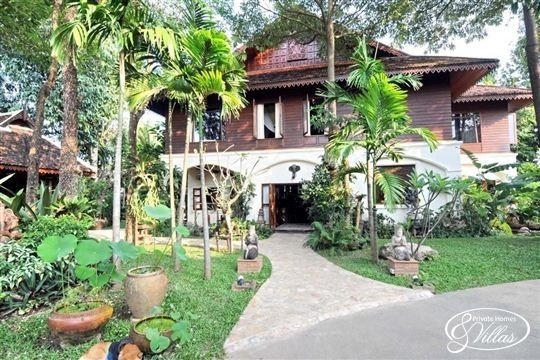 With a choice of three living spaces, six bedrooms and an expansive riverside garden and pool terrace, Baan Cheep Chang is an appealing choice for a large family gathering or group holiday. The pool provides a tempting focal point day or night, with comfortable sunbeds, a jacuzzi and a furnished sala (gazebo) offering ample opportunity for fun, sun and quiet contemplation. Although not ideal for toddlers due to a proliferation of delicate ornaments and statues; families with older children will certainly appreciate the villa's multifarious spaces. Fidgety or sunburnt offspring can head to the dedicated TV den (large flat-screen TV with satellite and DVD) for some cool comfort and entertainment, while workaholics can avail themselves of the fully equipped office. Outside, the walled and carefully landscaped tropical gardens can be enjoyed accompanied by either a Bose-speakered soundtrack or birdsong and gently trickling water. This is rural peace personified, and therefore the perfect spot to do little more than read and snooze. 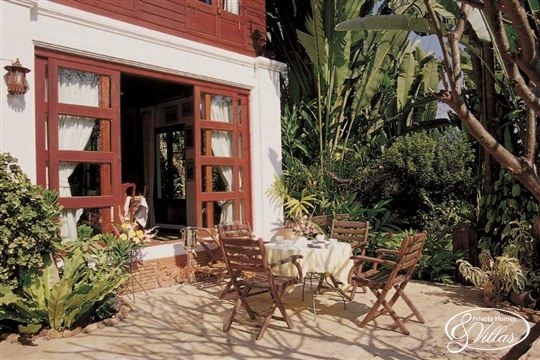 When hunger strikes, the villa's live-in cook prepares a healthy, filling breakfast and a tempting choice of Thai dishes (her cookbook is the menu) with the friendly but discreet villa staff serving drinks and meals throughout the day. Larger groups can gather at one of two large dining tables – either in the spacious main dining room or outside on the pool terrace – while for more intimate meals, smaller tables are strategically placed in garden nooks, one overlooking the river. Such space and flexibility also makes this an attractive option for weddings and other special celebrations. Exchanging vows at sunset on the villa's pontoon by the river would certainly make for a memorable matrimonial moment. 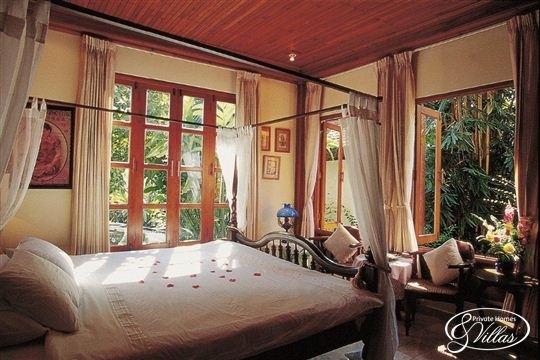 After a lazy day by the pool or sightseeing in and around Chiang Mai old town (a car and driver is included in the villa rate), restful sleep is guaranteed courtesy of the luxurious four-poster beds in each one of the six bedrooms. The river-view bedroom pavilion is the most private, but all are spacious and comfortable, and three boast indulgent bathtubs for a languid soak. Late risers may occasionally be woken a little earlier than planned courtesy of the village tannoy system, but with such an idyllic setting to enjoy, making the most of the day seems the wiser option. Luxury meets Thai heritage on a northern riverbank. 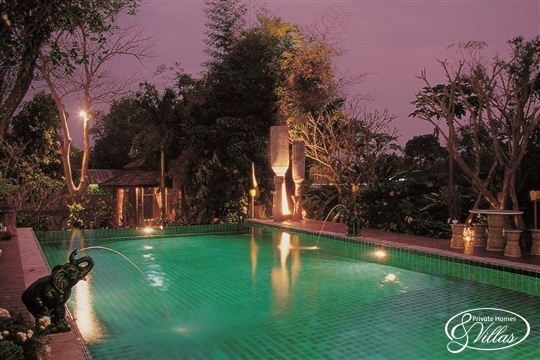 Our stay at Baan Cheep Chang was the perfect antidote to the normal daily stresses of city life. After a warm greeting from the amenable staff, the pace quickly shifted down a gear as we relaxed into the peaceful, green surroundings and slipped into the soothing waters of the delightful pool. We chose Chiang Mai over Thailand's beach destinations because we wanted to experience the country's culture as well as its natural attractions. This villa was the perfect base to do just that; the architecture and interiors offering a cultural journey in themselves (we couldn't help but make regular stops between rooms to peruse the intricate woodcarvings, statues and paintings and old photos that fill the villa). 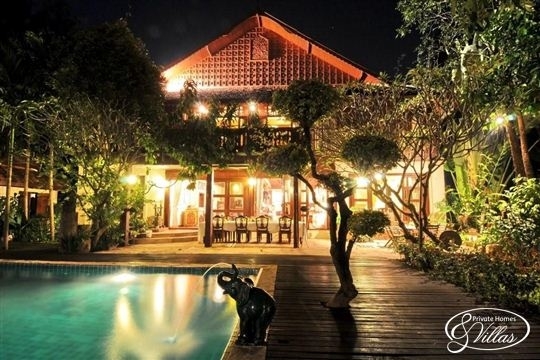 After two days relaxing poolside and another two exploring the stunning Chiang Mai countryside, coming home to healthy home cooked meals, we left Baan Cheep Chang relaxed, inspired and vowing to return. 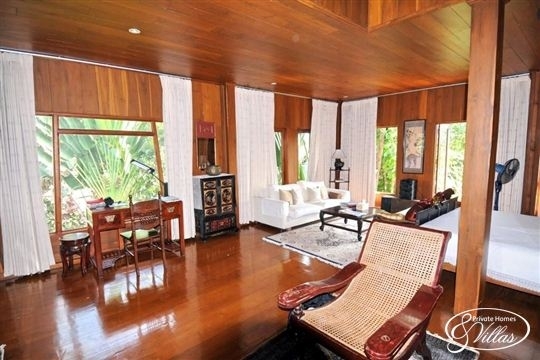 The sheer amount of space, inside and out, makes this villa a comfortable share for groups or a couple of families. The bedroom suites, expansive pool terrace and riverside sala allow for a good balance between social and private time. The pool is very generous by most villa standards and lazing in the jacuzzi after dark with a drink in hand, the moon and stars overhead and the river flowing in the background is a rare and supremely relaxing treat. 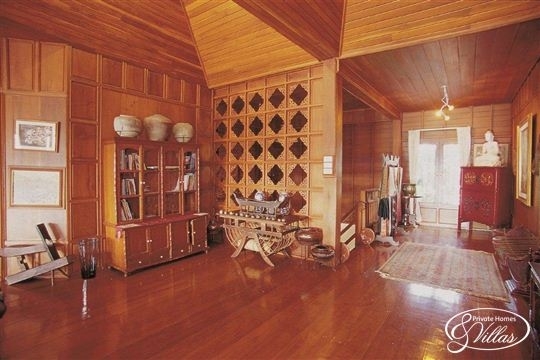 The proliferation of ornaments and antiques inside the villa means you have to tread a little carefully so this is not an ideal choice for families with adventurous youngsters. The decking and wooden panels on the main balcony and riverside pontoon were a little insecure in places, also a worry if children are running around. 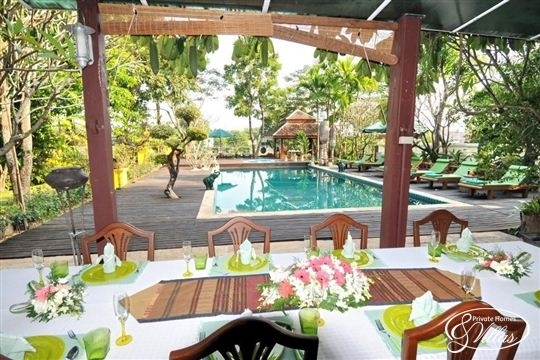 Baan Cheep Chang sits on a quiet, rural lane right by the Ping River on the outskirts of Chiang Mai. The quiet street that backs the villa has a handful of local shops, while it's a short drive to Hang Dong (5km), which has a wider choice of shops and facilities. 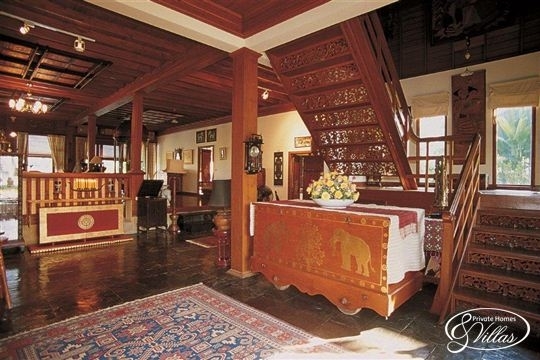 Chiang Mai is the most culturally significant city in Thailand; rich in heritage and populated with welcoming people. The city boasts over 300 temples, known locally as 'wats', reflecting the country's predominant Buddhist religion. The region is also well known for its handicrafts, which include hand-woven Thai silk, delicate silver jewellery and an ancient tradition of umbrella making from mulberry paper and bamboo. The city's many markets make Chiang Mai a shopper's paradise. The Night Bazaar is a bustling nightly event, while the less-touristy Sunday Walking Street on Ratchadamnoen Road also features vendors selling unique handmade items, clothes and food. Chiang Mai also offers an abundance of restaurants, from street hawkers to fine dining. 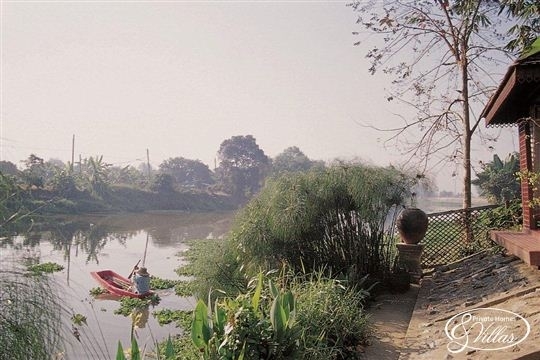 Nimmanhaemin Road is the city's most salubrious food and nightlife zone, while restaurants such as Riverside and The Brasserie also offer great food and live music on the banks of the Mae Ping River. Chiang Mai International Airport has daily connections with Bangkok, as well as other Southeast Asian destinations, including Singapore, Korea, Hong Kong, Taiwan, Laos, and Cambodia. Travel within the city is easy. Song Thaew's (red converted pick-up trucks) are the most convenient way to get around. Chiang Mai is the second largest province in Thailand and sits on a wide, fertile plain framed by the foothills of the Himalayas. Lush valleys and waterfalls are hidden within the surrounding mountains so there's plenty of opportunity for outdoor adventure. In fact easy access to the towering beauty of Northern Thailand makes this one of the most visited regions in the Kingdom. A good number of travel companies in the city offer day trips and longer tours to the most popular sites and natural attractions, many of which can also be reached in a hire car. The province boasts some of the tallest mountains and most impressive waterfalls in Thailand, most of them located within one of the region's many National Parks. Trekking to remote villages to visit unique hill tribe communities is also a major draw; many of the villagers live off the land and still wear traditional clothes, speak their own language and follow centuries’-old customs. Adventurous travellers are also well catered for around Chiang Mai, with whitewater rafting, kayaking, mountain biking, zip line tours, rock climbing, river fishing and even hot air ballooning just some of the thrills on offer. The best time of the year to visit the province is between November and April when the weather is cool and invigorating and the region's famous flowers are in bloom. April is also a busy time, as Chiang Mai is known as one of the best places to experience Songkran, the wet but fun-filled Thai New Year festival. 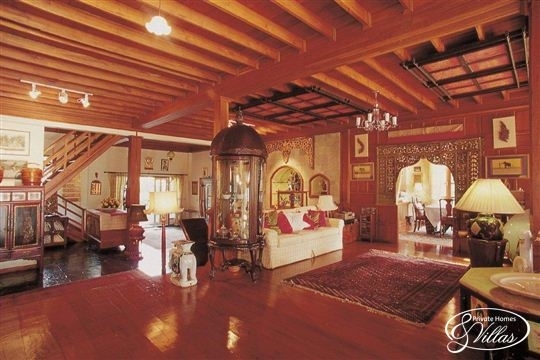 Baan Cheep Chang is something of a private gallery. 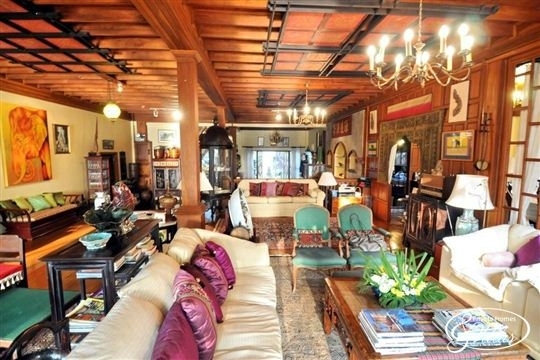 The owner clearly has a collector's eye and the traditional decor and omnipresent artefacts give every room a heritage feel. 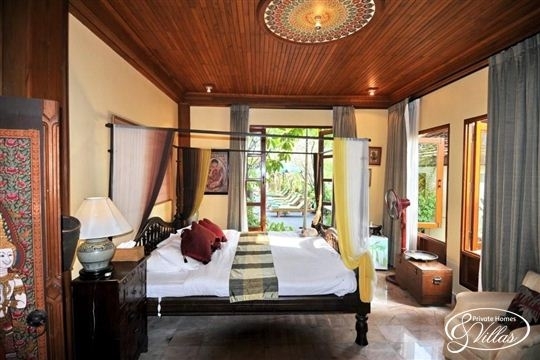 The house, built mostly of teak, is arranged over three buildings: the main, two-storey villa boasts four spacious bedrooms (three upstairs, one downstairs), each with high ceilings and air conditioning and furnished with an antique four poster bed draped with mosquito netting. All four bedrooms in the main building have ensuite bathrooms – two with bath tubs. 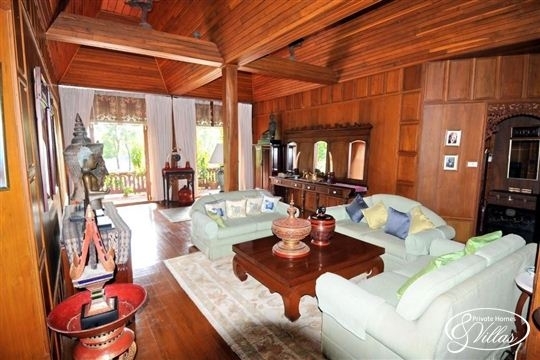 The fifth bedroom occupies its own Thai-style pavilion and overlooks the banks of the river while the sixth is in a garden pavilion towards the rear of the property and boasts a rustic wooden bathtub in its ensuite. Three of the rooms have views of the pool and river while the two stand-alone bedroom pavilions each have their own private terraces. Upper and lower floor lounges, a large reception and a bar area mean groups are easily catered for. The dining room can seat 14 indoors comfortably and there's an outdoor table under the veranda by the pool which seats ten. Staying connected to the outside world is not a problem either, with a comfortable TV/DVD room attached to the lower lounge and an upstairs study with computer, fax and WiFi internet (the latter complimentary and accessible throughout most of the villa grounds). 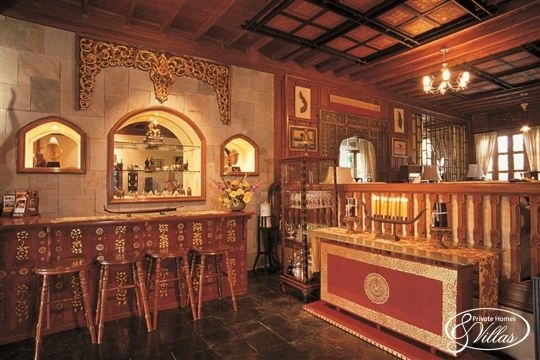 A service kitchen is housed in the staff quarters where the chef prepares meals to order, while a second guests' kitchen inside the main villa connects to the dining room and boasts modern facilities for those wishing to self cater. 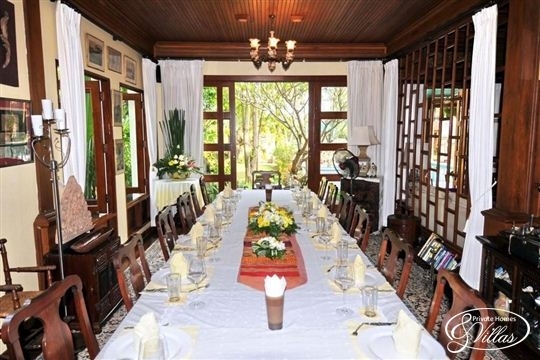 The villa also comes with a good selection of table and glassware for entertaining. Making the most of the views, a balcony extends from the upper lounge and offers fine vistas over the pool to the river. 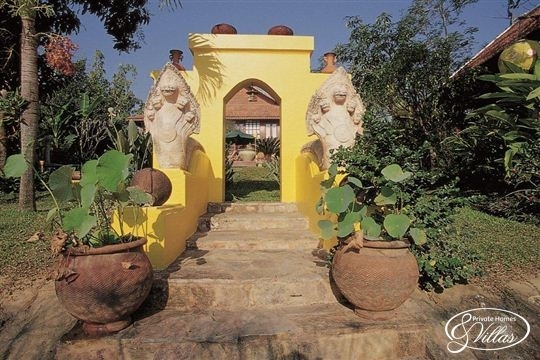 The gardens are beautifully landscaped with stone walkways leading to the bedroom pavilions. 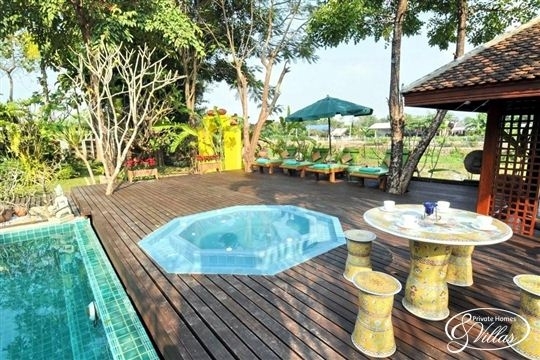 At the far end of the pool, by the river, a wide terrace houses a jacuzzi and a furnished Thai style sala. Steps lead down to small pontoon with wooden benches either side, excellent for fishing or sunset cocktails. 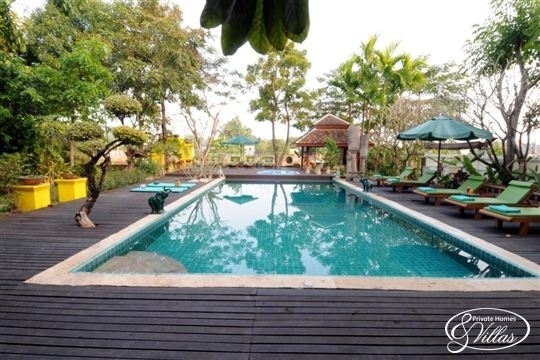 6 bedroom villa located in Chiang Mai City, Chiang Mai Province. Ideal for Body and soul, Bring the relatives, Going for golf, Fair share for groups, The great outdoors, Party pads, Room with a view, Perfect for weddings.